Kerala KEAM Result केरल केईएएम सामान्य प्रवेश परीक्षा परिणाम) 2017: KEAM is also called as CEE Kerala (Combined Entrance Exam). Commissioner of entrance examination, Kerala organizes KEAM for the aspirants who are willing to take admissions in various engineering programs in Kerala State. The KEAM 2017 will be conducted on 24th & 25Th April 2017 and the Kerala KEAM 2017 Result will be declared on or before 25th May 2017. Aspirants can check KEAM 2017 Result on the official website. The Kerala KEAM 2017 Answer Key will be out before few days of the results. The aspirants who will qualify the exam will be called for KEAM 2017 Counselling & KEAM 2017 Seat allotment. The ranks will be given on the basis of marks acquired by the aspirants in the entrance exam. 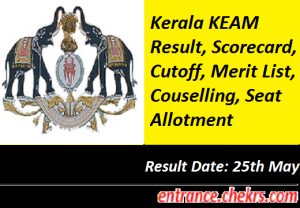 Aspirants who have appeared in the KEAM exam 2017 can access their Kerala KEAM CEE 2017 Results on the official website on or before 25th May 2017. Students are advised to take printouts of their scorecard because on the day of counselling along with their documents they will also require the scorecard to join the counselling process. There are some steps given below to download the KEAM 2017 Scorecard. Fill all the required details like roll number and application number. Aspirant’s result will be displayed on the screen. Download and also take a printout of the result of the counselling process. KEAM 2017 Exam 24th & 25th April 2017. The KEAM 2017 Cutoff will be based on the Marks obtained by the aspirants of different categories. The cutoff will be released in the form of marks and ranks through which a merit list will be prepared. There is a list given below about the previous year cutoff for the admissions in top government colleges in Kerala state. The merit list for KEAM 2017 will be prepared on the basis of the marks obtained by the applicant in the entrance exam. The merit list will decide whether the aspirant is qualified or not. All the qualifying aspirants will be called for the counselling process for their preferences of the colleges. CEE Kerala will release KEAM Rank list 2017 on the official website on 20th June 2017. In the rank list, the ratio of fifty-fifty will be taken in which 50% marks will be given on the basis of KEAM 2017 and rest 50% will be given on the basis of qualifying exam i.e. 12th(PCM together). The aspirants who will qualify the entrance exam will be called for the KEAM Counselling 2017. It will be organized by Commissioner for Entrance Examinations which will be done via Single Window System. KEAM 2017 Seat allotment for First, Second, Third last rank will be done by Centralized Allotment Process. The seats will be allotted on the basis of merit and after the seat allotment aspirants have to report in the allotted institute to confirm their admission. During the seat allotment process, a trial will be conducted for the selected students, so that they can get information about the KEAM 2017 Seat Allotment for 1st, 2nd and 3rd last rank. For more queries and feedback regarding the KEAM 2017 Result, you can contact us by commenting in the comment section given below.